2019 Art Palm Springs, Palm Springs, California. 2018 Shanghai Contemporary Art Fair, Shanghai, China. Sitka Art Invitational, World Forestry Center, Portland, Oregon. Layers: The Evolving Art of 3D Printing, Lakewood Center for the Arts, Lake Oswego, Oregon. Art New York, New York City, New York. Alchemy in 3D, Art at the Cave Gallery, Vancouver, Washington. Overview, Portland Community College, Portland, Oregon. Art Palm Springs 2018, Palm Springs, California. Palm Beach Modern + Contemporary, West Palm Beach, Florida. Group 2018, Andrea Schwartz Gallery, San Francisco, California. 2017 Art Miami 2017, Miami, Florida. Andrea Schwartz Gallery, San Francisco, California. New Sculptures by Julian Voss-Andreae, Hohmann Fine Art, Palm Desert, California. Mad Pursuit: Exploring Science Through the Lens of Art, Ford Gallery, Portland, Oregon. Art Miami New York 2017, New York City, New York. Napa Valley Arts in April, Bardessono Hotel & Spa, Yountville, California. Art Revolution Taipei Art Fair 2017, Taipei, Taiwan. Art Palm Springs 2017, Palm Springs, California. 2016 Art Miami 2016, Miami, Florida. CONTEXT Art Miami 2016, Miami, Florida. Monaco Yacht Show 2016, Port Hercules, Monaco. 510 museum & ARTspace, Lake Oswego, Oregon. Encounters Between Biology and Contemporary Art, Central Academy of Fine Arts Museum, Beijing, China. A Visual Chronicle of Lake Oswego: Gallery Without Walls, Lakewood Center for the Arts, Lake Oswego, Oregon. 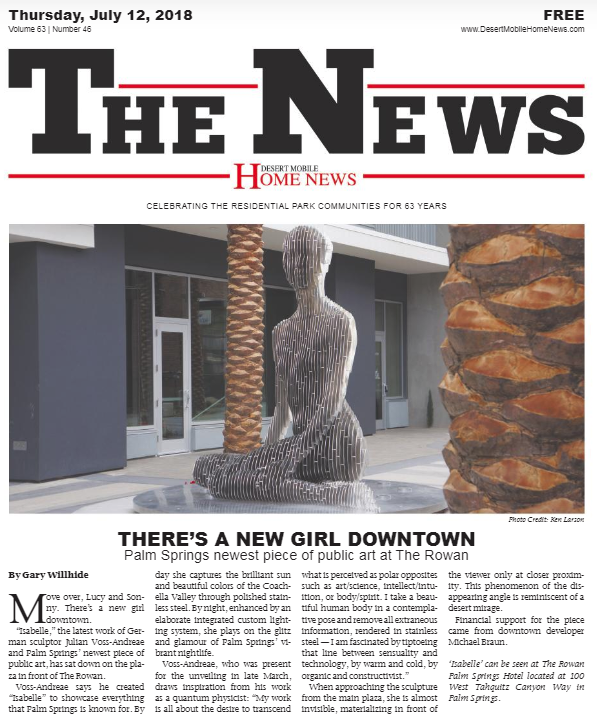 HOHMANN Celebrates 40th Anniversary, Hohmann Fine Art, Palm Desert, California. Artworks Northwest 2016, Umpqua Valley Art Center, Roseburg, Oregon. Art Revolution Taipei Art Fair 2016, Taipei, Taiwan. 2nd National Juried Exhibition: Art + Science, Tom Thomas Gallery, Indiana University East, Richmond, Indiana. 2016 Outdoor Sculpture Invitational, Clackamas Community College, Molalla, Oregon. 2015 Art San Diego Art Fair 2015, San Diego, California. International Sculpture Center LittleSCULPTURE Show, Bentley Gallery, Phoenix, Arizona. Silicon Valley Art Fair 2015, San Francisco, California. Holding Sway, Pacific NW College of Art, Portland, Oregon. Tech + Art, The Ann Arbor Art Center, Ann Arbor, Michigan. Boloix Fine Arts Gallery, Sun Valley, Idaho. Art Revolution Taipei Art Fair 2015, Taipei, Taiwan. Palm Springs Fine Art Fair 2015, Palm Springs, California. 2014 2nd International Conference of Science, Technology, and Art Relations, Technion, Haifa, Israel. Un-Natural Nature, Eastwood, New York City, New York. Seaport Celebration Industry & Art Exhibition, Port of Portland, Portland, Oregon. Art of the Allison Sculpture Exhibition, The Allison Inn & Spa, Newberg, Oregon. Oregon Art Beat Exhibition, Peoples Art of Portland, Portland, Oregon. Palm Springs Fine Art Fair, Palm Springs, California. 2013 LittleSCULPTURE Show, International Sculpture Center, Miami, Florida. Pittman Addition HydroPark, Portland, Oregon. Christian Hohmann Fine Arts, Palm Desert, California. Elements in Balance, Annmarie Sculpture Garden, Solomons, Maryland. Downtown Abstractions, Stamford, Connecticut. Curated by Eileen Heckerling. Art on Fourth, Ketchum, Idaho. Aesthetica Art Prize Exhibition, York St Marys, York, United Kingdom. 2012 5th Beijing International Art Biennale, National Art Museum of China, Beijing, China. Curated by Wu Changjiang. ESID conference 2012, Florence, Italy. New Works, Frederic Boloix Fine Arts Gallery, Sun Valley, Idaho. Chisel & Brush, Talisman Gallery, Portland, Oregon. Clackamas Outdoor Sculpture Exposition, Oregon City, Oregon. Curated by Rick True. Science Art 2012, The Central House of Artists, Moscow, Russia. Curated by Simon Erohine. 2011 Arsmathematica Intersculpt 2011, Galerie Luc Monod, Paris, France. Curated by Mary Visser and Christian Lavigne. Science and Art, Sarah Silberman Art Gallery, Montgomery College, Rockville, Maryland. Curated by Kay McCrohan and Percy North. Quantum Jazz Biology * Medicine * Art, ISIS meeting, London, UK. Measure for Measure, Central Booking Gallery, Brooklyn, New York. Curated by Maddy Rosenberg. 2010 Attract/Repel, Central Booking Gallery, Brooklyn, New York. Curated by Maddy Rosenberg. Scienar Exhibition, University of Calabria, Arcavacata di Rende, Italy. Chemical Reactions, Central Booking Gallery, Brooklyn, New York. Curated by Maddy Rosenberg. Art & Science Exhibition, ISMB 2010, Boston, Massachusettes. Curated by Milana Frenkel-Morgenstern. Evergreen Aviation Museum, McMinnville, Oregon. Art Inspired by Science, Schneider Museum of Art, Ashland, Oregon. Curated by M. Crane, R. L. Chianese, and J. Hafernik. Interferente, National University of Art, Bucharest, Romania. Curated by Gheorghe Samoila. 2009 Worlds Within Worlds: Quantum Objects, American Center for Physics, College Park, Maryland. Curated by Sarah Tanguy. Art in the Pearl, Portland, Oregon. Coos Art Museum, Coos Bay, Oregon. Structures to Sculptures, Centre for Cellular and Molecular Biology, Hyderabad, India. Curated by Madhusudan W. Pandit. 2008 El Paseo Invitational Exhibition, Palm Desert, California. Curated by M. Stephenson. Swiss Institute of Bioinformatics, Lausanne, Switzerland. Curated by Vivienne B. Gerritsen. Onda Gallery, Lake Oswego, Oregon. Big Rock Garden Sculpture Exhibition, Big Rock Sculpture Park, Bellingham, Washington. Art and Mathematics: The Wonders of Numbers, The Heckscher Museum of Art, Huntington, New York. Curated by Lynn Gamwell. Natural Beauty, Sixth Street Gallery, Vancouver, Washington. Juried by T. Donahue. Inspired by Life, Rutgers University, New Jersey. Curated by Christine Zardecki. 2007 West Edge Sculpture Exhibition, Seattle, Washington. Juried by Michael Darling, Barbara Shaiman, and Gregory Robinson. Clackamas Outdoor Sculpture Exposition, Oregon City, Oregon. Curated by Rick True and Terry Chatkupt. Lane Community College Outdoor Sculpture Exhibition, Eugene, Oregon. Curated by Andreas Salzman and Lee Imonen. Mein Gen, das hat fünf Ecken, Zentrum für Kunst und Medientechnologie, Karlsruhe, Germany. Curated by Andreas F. Beitin and Gregor Jansen. Outdoor Sculpture Exhibition, La Conner, Washington. Curated by Margaret C. Arnett. Outdoor Sculpture Invitational, Maryhill Museum of Art, Goldendale, Washington. Curated by Lee Musgrave. German American Artists, German Consulate General, San Francisco, California. Sculpture Without Walls, Moses Lake, Washington. Natural Cycles, Tryon Creek State Park, Portland, Oregon. Lake Oswego Visual Arts Chronicle, Lake Oswego, Oregon. Orange Memorial Park Sculpture Garden, South San Francisco, California. Westcott Bay Reserve Sculpture Garden, San Juan Island, Washington. Juried by Kay Kammerzell. Iron and Steel, Alexander Gallery, Clackamas Community College, Oregon City, Oregon. Curated by Rick True. 2005 Art Intersect Science, Lucid Gallery, San Francisco, California. Curated by Kristin Henry. New Art on the Block, Disjecta Fundraiser, Portland, Oregon. AFFAIR @ the Jupiter, The Jupiter Hotel, Portland, Oregon. Juried by Stuart Horodner and Laurel Gitlen. Pacific Northwest Sculptors Exhibition, Allied Arts Gallery, Richland, Washington. I’m Ready For My Close Up, Washington Gallery of Photography, Bethesda, Maryland. Juried by Missy Loewe. Pacific Northwest Sculptors Exhibition, Portland Center for Performing Arts, Portland, Oregon. Arlene Schnitzer Concert Hall, Portland, Oregon. Portland Modern Showcase, Gallery 500, Portland, Oregon. Juried by Mark Brandau. 2004 Lifeboat Miami, Art Basel, Miami Beach, Florida. Curated by Paul Middendorf. Emerging Artists Exhibition, Catlin Gabel School, Portland, Oregon. Curated by Becky Wynne. Multnomah Democrats Fundraiser, Portland, Oregon. Redmond Sculpture Garden, Redmond, Washington. Juried by Kay Tarapolsi. 5th Annual Wilsonville Festival of the Arts, Wilsonville, Oregon. B.F.A. Thesis Exhibition, PNCA, Portland, Oregon. Synthesis, Feldman Gallery, Portland, Oregon. Chop Shop, PNCA, Portland, Oregon. Juried by Stuart Horodner. 4th Annual B.F.A. Exhibition, PNCA, Portland, Oregon. PNCA @ OHSU, BICC Gallery, Oregon Health and Science University, Portland, Oregon. Fantasy World, Higgins Gallery, PNCA, Portland, Oregon. DNA Art & Science, Contemporary Art Museum, Tampa, Florida. 2003 Co7 Gallery, Portland, Oregon. B.F.A. Sculpture Exhibition, Manuel Izquierdo Sculpture Gallery, Portland, Oregon. Junior Exhibition, PNCA, Portland, Oregon. 4th Annual Wilsonville Festival of the Arts, Wilsonville, Oregon. 3rd Annual B.F.A. Exhibition, PNCA, Portland, Oregon. Artifice, Manuel Izquierdo Gallery, Portland, Oregon. 2002 2nd Annual B.F.A. Exhibition, PNCA, Portland, Oregon. For the Love of Art (PNCA Fundraiser), Portland, Oregon. 1991 Jugend sieht Architektur, Rathaus Altona, Hamburg, Germany. 1990 Jugend sieht Architektur, Rathaus Altona, Hamburg, Germany. 2018 Palm Springs Buzz Award 2018. Public Artwork “Isabelle”, 2018. 2017 2017 CODAawards. Winner in the Education Category for Spannungsfeld. 2016 A Visual Chronicle of Lake Oswego. Best in Show Award for Slender Sentinel. 2012 PIDart Expo ESID 2012 Competition. Florence, Italy. 2nd prize for Angel of the West. Next Big Idea Art Competition. Los Alamos, New Mexico. Judges’ Choice Award for Quantum Man. 2011 Travel Grant and Invitation to The Institute of Science in Society conference. London, UK. 2009 Travel Grant and Invitation by the British Council to “Einstein and Picasso” conference. Dortmund, Germany. 2008 Big Rock Garden Sculpture Exhibition. Bellingham, Washington. Juror’s Choice Award for Unraveling Collagen. 2007 Sculpture Without Walls. Moses Lake, Washington. 1st Prize (People’s Choice Award) for Quantum Man. Sculpture Without Walls. Moses Lake, Washington. 4th Prize for Sister (Warrior). ACA Art in Crystallography Contest. Honorable Mention for Unraveling Collagen. 2005 Regional Arts & Culture Council Professional Development Grant. 2004 The Scientist 2004 Art Contest. 1st Prize for Light-Harvesting Complex. Departmental Nomination for the International Sculpture Center Outstanding Student Award. PNCA Merit Scholarship (Shana Wheeler Memorial Scholarship). 2003 Departmental Nomination for the International Sculpture Center Outstanding Student Award. 3rd Annual B.F.A. Exhibition. Best in Show Award for Tall Alpha Helix. 1997 Tenor Scholarship of the Royal Choral Union. Edinburgh, UK. 1991 Jugend sieht Architektur Competition. Special Prize for “Landhaus Godeffroy”. 1990 Jugend sieht Architektur Competition. First Prize for “Hansen’s Weisses Haus (Elbchaussee 547)”.